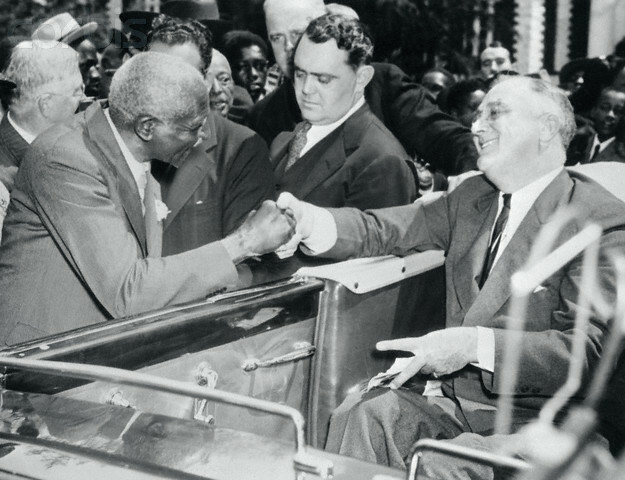 By the time Franklin Delano Roosevelt (FDR), shown shaking hands with legendary Tuskegee University scientist George Washington Carver above, was sworn in as President of the United States in March of 1933, the country had experienced three years of Great Depression. With millions out of work or having lost their life’s savings, those who blamed the nation’s economic woes on Republican Herbert C. Hoover cast their hopes on Roosevelt’s plan to reinvigorate the economy through government sponsored work and social programs. Prior to 1932, most blacks who had the ability to vote outside of the south typically registered and voted as Republicans, the so-called “Party of Lincoln,” the 16th president whose Emancipation Proclamation symbolically ended slavery in 1863. To many blacks, the Democratic Party of the early 1930’s was the official party of Jim Crow in that a solidly Democratic south had written Jim Crow laws that effectively relegated blacks to second class citizenship status. Indeed, it was not until 1924, eight years prior to Roosevelt’s election, before blacks were even allowed to attend the Democratic convention. Even in other parts of the country where more progressive if not patrician Democrats like FDR held sway, it was commonly known that the proverbial straw that stirred the Democratic south and midwest drinks were held by virulent racists and moderates who turned a blind eye to their more twisted conservative Democratic brethren. Thus, FDR to many blacks seemed like the only hope for change and during his never to be matched four elections, Roosevelt would consistently garner more than 70 percent of the black votes in areas where blacks could cast ballots. Cognizant that blacks had not received much favorable government attention since Reconstruction, and understanding that since the 19-teens under President Woodrow Wilson that blacks had been completely shut out of federal government employment, Roosevelt sought to make incremental changes in this reality. Blacks were eligible for work and services within many of his so-called “alphabet soup” agencies as well as being eligible for social security and public housing projects spawned by FDR’s New Deal. FDR went a step further and established what many historians refer to as his “Black Cabinet,” a group of informal advisers who lobbied his administration for even greater black inclusion within every facet of American life. Chief among these advisers was Dr. Mary Mcleod Bethune, a founder of Bethune Cookman College (now university) in Daytona Beach, Florida, who at the time was one of the nation’s foremost experts in education. Bethune had been a staunch Republican before meeting FDR–she, too, soon switched parties and allegiance to the New Deal. Parallel to FDR’s rise in the 1930’s was the rise of Adolf Hitler in Germany. Hitler was sworn in as German Chancellor in January of 1933, two months before FDR’s first inauguration. Within the next decade, Hitler was well on the way to fulfilling his dream of eliminating Jews from Europe through genocide, and in the notorious Auschwitz Concentration Camp, one figure in particular, Dr. Josef Mengele, a physician, was infamous for his horrific “scientific” experiments that he conducted on Jewish men, women and children. While Dr. Mengele’s pernicious predilections are well-known to students of history, less known and discussed is that here in America, so-called “scientific” experiments were being conducted in Tuskegee, Alabama on unsuspecting poor black men. Beginning in 1932, poor sharecroppers in Macon County, Alabama were at times injected with syphilis or having already contracted the same, were forbidden any medical treatment by the U.S. Public Health Service. What makes this practice even more chilling is that when penicillin became prevalent to treat this disease in the early 40’s, such treatment was still withheld by the doctors and researchers who were paid by their own government to “observe” their fellow citizens who were effectively serving as guinea pigs. This program, sadly, would continue until finally ended in 1972–the year I was born. Separately, as America moved steadily toward war with Nazi Germany and the Axis powers in 1941, a number of prominent civil rights activists, including A. Phillip Randolph and Dr. W.E.B. DuBois, lobbied FDR to open war industries to blacks as well as to desegregate the military. In time, many factories did employ black men and women to produce war goods, but Roosevelt hedged on the complete integration of the military, an event that would occur on the watch of his successor in office, Harry Truman, who signed an Executive Order integrating the military in 1948. FDR, under encouragement of his wife Eleanor, did give a nod of approval for the establishment at Tuskegee of a training center to teach black fighter pilots. As had been the case in many previous wars, the popular belief was that black men lacked the intellectual acuity and/or courage to fly warplanes. The “Tuskegee Airmen,” or the 332nd Fighter Group also known as “Red Tails,” would go on to distinguish themselves greatly in the European Theater of War under the leadership of then Army Captain and later Air Force General Benjamin O. Davis Jr.
Later, FDR also issued an Executive Order creating segregated units in the United States Marine Corps, a service organization that had been strictly white from 1798 until 1942. While blacks served America with great distinction during World War II, as had been the case during World War I, upon returning home from war, many soldiers, sailors and Marines found themselves increasingly more disgusted that they had fought, bled and seen comrades die to end Fascist tyranny only to return to Jim Crow business as usual in the south. Many of the early leaders of what would become known as the Civil Rights Movement had either served in the military or having been too young to fight but old enough to be aware of the hypocrisy, were impacted by this very notion, as we will consider in future lessons this month.